The Armenian parliament voted to elect opposition leader Nikol Pashinian prime minister on Tuesday nearly one month after he launched sustained anti-government protests that led to resignation of Armenia’s longtime leader, Serzh Sarkisian. Pashinian was backed by 59 of the 105 members of the National Assembly. They included 13 lawmakers representing Sarkisian’s Republican Party of Armenia (HHK). Forty-two other HHK deputies voted against him. The HHK’s parliamentary leader, Vahram Baghdasarian, made clear just before the vote that his party still has serious doubts about Pashinian’s ability to govern Armenia but will nonetheless help him become prime minister in order to restore “political stability” in the country. “Mr. Pashinian, you will be elected prime minister … God willing, you will dispel the lingering concerns of the HHK faction,” said Baghdasarian. 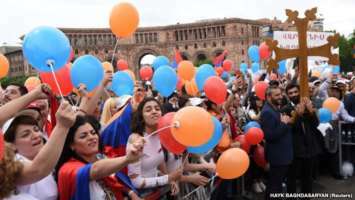 “I will serve the people of Armenia and the Republic of Armenia,” Pashinian declared immediately after the vote which sparked jubilant scenes in Yerevan’s Republic Square where tens of thousands of his supporters gathered to celebrate his widely anticipated rise to power. 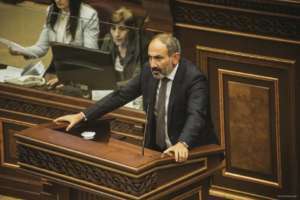 Addressing the parliament before the vote, Pashinian pledged to implement “very serious reforms” that would democratize Armenia, strengthen the rule of law and radically improve the domestic business environmental. Pashinian made clear at the same time that he will not wage “vendettas” against members of the HHK and the previous governments and will preclude any “redistribution” of economic assets and properties. Also, he again ruled out major changes in Armenian foreign policy. In particular, he reiterated that Armenia will remain part of the Russian-led Eurasian Economic Union and the Collective Security Treaty Organization (CSTO). “We regard military cooperation with Russia as an important factor of ensuing Armenia’s security,” he said, adding he will also strive to deepen Armenia’s ties with the European Union and the United States. Pashinian further reaffirmed his plans to push for fresh parliamentary elections. But he gave no possible dates for the conduct of such polls. It remains to be seen whether the HHK, which continues to control the majority of seats in the parliament, will agree to them. The idea of fresh elections is also supported by businessman Gagik Tsarukian’s alliance and the Armenian Revolutionary Federation. Both political groups have backed the Pashinian-led street protests against Sarkisian’s attempt to extend his rule, which began in Yerevan on April 13 and intensified dramatically in the following weeks. Sarkisian, who served as Armenia’s president from 2008-2018, stepped down as prime minister on April 23. Pashinian declined to shed light on the composition of his cabinet when he spoke to reporters moments after being elected prime minister. He said his ministers will be chosen “as a result of discussions” with his allies and other political groups. 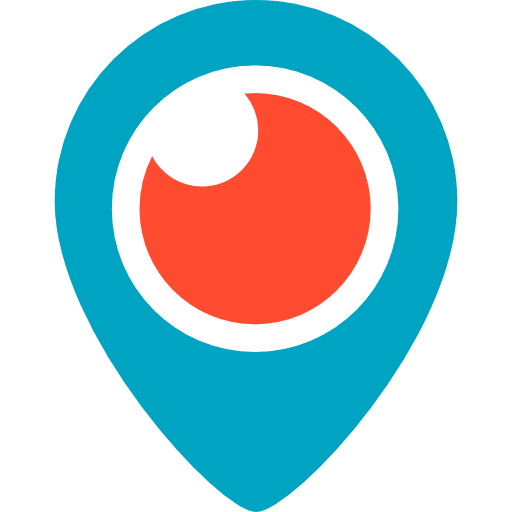 The rally, which also featured speeches by two prominent artists supporting the protest movement, was followed by a live concert. Pashinian, is a former journalist who edited Armenia’s best-selling daily newspaper, “Haykakan Zhamanak,” from 1999-2012. He also has a long history of political activism. He first ran for the parliament in 2007 as the top candidate of an opposition group that challenged then President Robert Kocharian. The group called Impeachment failed to win any parliament seats. Pashinian went on to play a major role in a broad-based opposition movement launched by former President Levon Ter-Petrosian, the main opposition candidate in a hotly disputed presidential election held in February 2008. The vote marred by reports of serious fraud formalized the handover of power from Kocharian to Serzh Sarkisian. Pashinian went into hiding following the deadly suppression on March 1-2, 2008 of post-election protests in Yerevan. He surrendered to law-enforcement authorities in July 2009 and was subsequently tried and sentenced to seven years in prison on charges stemming from the unrest. Like other Ter-Petrosian allies, he was released from jail in May 2011 under a general amnesty declared by the Sarkisian administration. A year later Pashinian was elected to the National Assembly on the ticket of Ter-Petrosian’s Armenian National Congress (HAK). He subsequently fell out with the ex-president and set up his own party, Civil Contract. Civil Contract and two other opposition parties, Bright Armenia and Republic, set up an alliance called Yelk (Way Out) ahead of Armenia’s last parliamentary elections held in April 2017. Yelk won 9 parliament seats. Both Bright Armenia and Republic refused to support Pashinian when he embarked on his campaign aimed at preventing Sarkisian from becoming prime minister and thus extending his decade-long rule. They said that he will fail to attract large crowds. Pashinian began the unexpectedly successful campaign in Armenia second largest city of Gyumri on March 31. He returned to Yerevan on foot on April 13 after walking more than 200 kilometers through the country’s northern and central regions in an effort to drum up popular support for his cause.